Back in the 1950s, hillbilly music's capital north of the border in Canada might have been in Hamilton, Ontario. 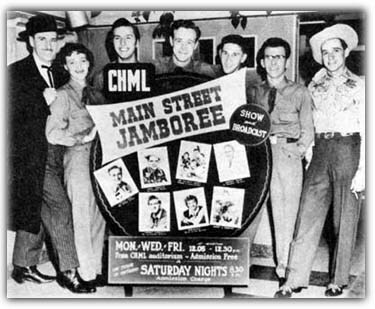 It was on CHML, 900 on the AM dial, every Saturday night at 8:30pm, the "Main Street Jamboree" turned into Canada's largest hillbilly and western music show of its kind. The show originated from the CHML Auditorium. We recently had the pleasure of hearing from one of the folks who was a member of the "Mainstreeters", Roly D'Eon who was kind enough to pass along some memories of the show. According to Roly D'Eon, there were three or four country music bands playing around the Hamilton, Ontario area around 1949. 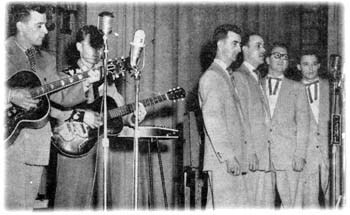 Roly was playing with Slim Gordon at the time and they heard that CHML was looking for talent for a new country show they wanted to put on the air. The group went to audition for the show. Their group wasn't the only one. Another fellow trying to make his way in the entertainment area was also there to audition, Gordie Tapp, who came over from Niagara Falls, where he was working on a small 1000 watt radio station. Gordie was trying out for the emcee role. Roly tells they auditioned, but didn't make the cut at the time. A bit of time went by and Roly got a call to play bass for a group led by Mike Patoma. They were going to audition for CHML. Roly went along again, but again, they didn't get the nod to join CHML. The pages of time turned again and Dave Folkes and his group of musicians were going to audition for CHML. Dave needed a bass player as well and Roly was a known commodity and was asked to help out again. Roly thinks there was a shortage of bass players in town at the time. He remembers that the technician remarked to him, "What, you again?". But again, the group didn't win acceptance. The years start to go by the wayside, and by 1952, CHML still didn't have the show going. Gordie Tapp made it down for every one of those auditions as well. When "rustic entertainment" (CHML's term in their publication) was popular in the early 1950s, they didn't think it was surprising that CHML would decide to take on the ambitious project for this type of show in Canada. The programs they had on the air back then and their listener requests told their instincts that this was something they needed to do. 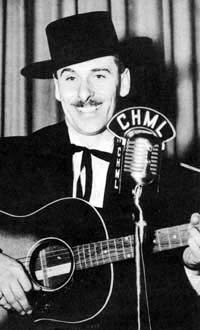 Ken Soble and CHML's Manager, Tommy Darling, decided to put on a two hour program which would be heard every Saturday night that would be a show-case for the finest folk and country talent in the business. CHML's Program Director, Russ Eastcott , was appointed producer , and so "Main Street Jamboree" was born. The three gentlemen had some stated goals in mind when they started the show. They wanted the entertainment to be appealing to the whole family. They also believed that programs of this type were as entertaining to see in person as they were to hear on the air. Its music would be called "folk music" because "folks" love it. They also felt that all performers put on a better show when they have a live audience before them. As we'll see, the "Hillbilly Jewels" seemed to be the catalyst for the show getting off the ground and on the air. Roly recalls the group came down from Owen Sound where they were stationed. It was about fall of 1952. They auditioned and won the station management over. The show finally started in November of 1952. The show aired from the basement of the station. 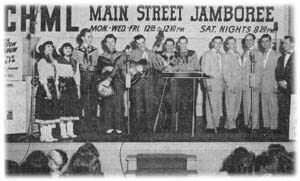 The big stars of the "Main Street Jamboree" was group called the "Hillbilly Jewels." Each member of the group was a star in their own right. Mengie Shulman of Radio Station VOCM, out of Saint John's, Newfoundland, brought the "Hillbilly Jewels" brought to CHML's attention when a talent search was being conducted to start the show. The Hillbilly Jewels included, Vivian Brown, who was known as "Brownie, Beautiful Belle of the Ballads." She sang vocals, played the guitar, fiddle and bass. She was a songwriter and was said to have several hits to her credit. Then there was Joe Brown, "Brownie's" brother, who played the role of emcee for their show, and doubled as "Little Joe" and "Tiny The Comedian." He sang vocals, played the guitar and bass Randy Stewart was tagged "The Louisiana Hillbilly." He was a singing accordionist and an outstanding showman. 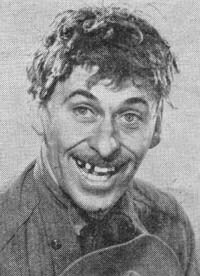 He was known for his sound effects and mimicry. 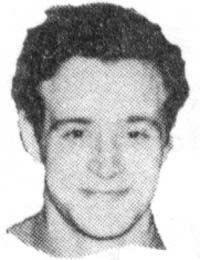 Sam "Speedy" Learning was an outstanding fiddle player and doubled up by playing the mandolin, guitar and bass. 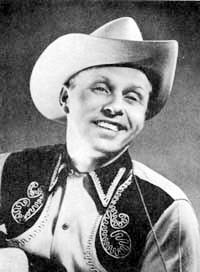 "Speedy" also wrote a great number of songs Finally there was Bob "Windy" Wingrove, acclaimed as the "Star of the Silver Steel" who played steel guitar for the Hillbilly Jewels. Roly goes on to note that the station wanted another gorup for the show. Jack Kingston came down from the CKNX Barn Dance show that was held in Wingham, Ontario. He brought along Lloyd Bank and Wally Traugott and became part of the show. But they needed a bass player. Guess who got the call? Slim Gordon gave them the phone number of Roly and he became part of the group. Roly remembers that audition fondly. When he got to the station, thinking it was another audition, he found many of the folks already there, waiting for him. Gordie Tapp was there. Maurice Bolyer, Russ Eascott and of course, Jack Kingston and the band. Roly thought it was an audition, but he tells us, it was really he who was 'on trial'. After the last note was played and the dust settled so to speak, Roly was accepted and the band was given the name the "Mainstreeters" by Russ Eascott. By early 1953, the show was gaining fans and momentum. Another band joined the show - the Lincoln County Peach Pickers. The show of course had its share of guests. 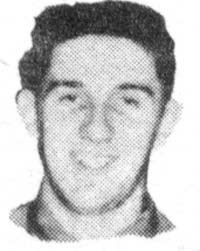 Roly recalls that folks such as Peggie Jo Stewart from Buffalo, the Young Twins (Jean and Joan) from the Welland area, Slim Gordon, Herb Lewis, Tommy Hunger, Lucille Starr, Myrna Lorrie, Jean Shepard, Faron Young, Hank Locklin, Ferlin Husky, Hank Thompson, Lefty Frizzell, Wilma Lee and Stoney Cooper and Dusty Owens among others. According to Mr. D'Eon, other folks who became regulars on the show were Glenn Mitchell and Sonny James. Others who were a part of the CHML Mainstreet Jamboree family included a little nine-year old singer by the name of Brenda Lee. The Bluegrass King, Jimmy Martin was there, too. The show began as a half-hour program on the local station. It later grew to an hour-long program, of which a half-hour was broadcast over the Canadian network, coast to coast. In 1954, television was starting to make its way into the scene. The show's sponsors wanted to see the show on television, so Ken Soble was given the task to make it happen. Eventually it did and the show was seen on television, perhaps in the late summer of 1954. The show had a square dance group. Mr. D'Eon notes that the group was John Davidson and "The Canadian Hoedowners". He says they were "...the best dance group I have ever seen." But they didn't stay with the show - they went to the "Country Hoedown" show. CBC replaced the group with something "more sophisticated" like the Singing Swinging Eight group which at the time included a fellow by the name of Gordon Lightfoot. But as the show's popularity grew, station management at CHCH thought they could demand more compensation from the show's sponsors. They essentially told the sponors to either pay a higher sponsorship fee or the show would have be moved from the prime time Saturday night slot at 7:00pm to Wednesday at 9:00pm. Management claimed they had another sponsor willing to pay more. But the sponsors were of the mindset that they were already paying top dollar and were not willing to pay more. The four sponsors were paying about $1,000 at the time. The show was moved to Wednesday at 9:00pm as station management threatened. And evidently did not promote the new timeslot to the listening audience. As one might expect, the ratings went down. That seemed to change the atmosphere for the artists with the show. Jack Kingston decided it was time to move on to Nashville. He wanted the group to go with him, but no one else did. The Mainstreeters broke up when Jack left. They played around the Hamilton area for a few more years, but could not use the name as Jack had bought the rights to the group name. Eddy Preston became their drummer in 1954 and is still around, in the Oakville area. Lloyd Bank is in Kitchener, Ontario. Wally Traugott lives in California. Glenn Mitchell resides in Ancaster. Gordie Tapp is also in the Hamilton area after enjoying many years on Hee! Haw!. Roly lives between Kingston and Smith Falls, Ontario. Maurice Bolyer and Jack Kingston have passed away. The funny and fabulous "Hillbilly Jewels"
We should mention a bit more about a couple of other stars on the show and let you explore the list of cast members for more information. One star of "Main Street Jamboree" and a permanent member of its cast since the first program, was a young and talented Jack Kingston. Jack appeared as a featured star on many radio stations in Canada and the United States. He also guested on the famed WLS National Barn Dance in Chicago. For many months, CKNX featured Jack and his yodeling on the CKNX Barn Dance. 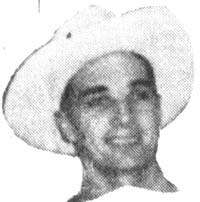 He was known as one of the best yodelers at the time but in addition to that singing talent, he was also one of the best square dance callers. And on the Main Street Jamboree, it was his calls that accompanied the music of the Main Streeters or the Hillbilly Jewels. Another star on the show was a fellow they called Gaylord who was the "effervescent" emcee, whose "...verve and good humor spark every program." When he wasn't doing the emcee chores for the Main Street Jamboree, he played the part of entertainer and radio personality, Gordie Tapp, who as we know went on to some fame later in his career as part of the long running legendary cast of Hee! Haw!. He had a show back then called "What's On Tapp" that he originated in 1946 on a radio station in Niagara Falls, then moved to Guelph, on radio station CJOY. From 1949 onwards to 1952 when we read about this, he was heard six nights a week, from 10:30pm to midnight on CHML. Hillbilly-Music.com wishes to express its appreciation to Roly D'Eon, former member of the Mainstreeters for contacting us and providing us with his recollections of the show's history.